Dr Athol Steward’s 400km walk from Raglan to Whanganui was an exciting, informative and at times, death-defying experience. 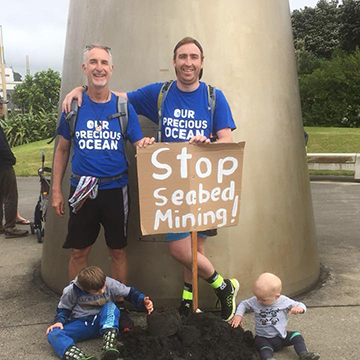 Accompanied by his sons Lloyd and Jonathan who walked 200km each, and supported by wife Lari who followed them in a campervan, Dr Steward set out to raise awareness about the issue of planned sea-bed mining along the West Coast of New Zealand. The 16-day long walk, which was a many faceted experience, will be the topic of a talk at the Sarjeant Gallery, Sunday 18 February 2018 at 4.30pm, $5 entry, as part of Speakers for the Sarjeant series fundraising for the redevelopment of the gallery. Dr Steward will talk about his adventures in a remote, rugged part of New Zealand unknown to most. The talk, illustrated by photographs, will range widely to include the issue of seabed mining and the environmental health of the planet. On a related and more personal note he will share his thoughts about healthy eating and the role of exercise. His experience of the beautiful west coast and marine environment has invigorated Dr Steward in his campaign. They went through tunnels at Waikawau (70 meters) and 90 meter cliffs that had been hewn with pick and shovel through the mountainsides, to allow stock to access the beach. This was the easiest way of moving the animals because the forest inland was so dense in the late 1800s. They clambered over rocks and boulders and saw all sorts of interesting things – gannet, tern, endangered crane colonies, seals and penguins, and the extraordinary Elephant Rocks at Tongaporutu north of New Plymouth. There were a few “incidents,” which the talk will reveal. Not only did they swim across two harbours (Kawhia and Aotea) and various river mouths with their 40 litre backpacks, but Dr Steward and son Lloyd also found themselves at the end of one day’s walk between the proverbial rock and (in this case) a watery place.